How Venom will look like in Spider-man 3! Discussion in 'Spider-Man 1, 2 & 3' started by Dave Kocher, Apr 16, 2006. Forgive my awful drawing, but since the black suit is designed like the orignal spidey outfit, does that mean venom will like like spider-man costume as as well only black? The only difference with venom is that he be bigger than spidey and he will have a mouth with sharp teeth and a tounge. Look at my awful design to get a good visual on how venom will be portrayed. Yeah of course venom will be wearing the same clothes. He always got spidey's hand-me-downs afterall. He might just be skinny and not hulkish too. And god that's some brilliant art. I can't stop starring at it. here is a manip that I saw I take no credit for it what so ever. But this is a better vision in how I think venom will look like. I'm more than ok with that! Yeah, that's pretty vicious. It kind of reminds me of Spawn. Does anyone have that amazing manip of GG2, THC as Sandman and Venom all closing in on Spider-Man in mid-air? (Please post!) 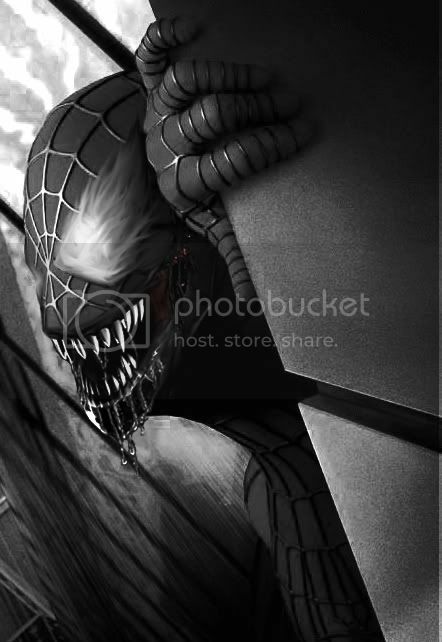 I would love to see Venom look like that. Nice. Now why don't you go put that on your mommys fridge i'm sure she'll like it. ^It's in the fan art thread. damn thats nice..but he kinda looks too 'solid' if you know what i mean..cos in the comics you punch him and his body moves to that shape, and then restortes.. I always thought if they could get Venom to move the way Spawn's cape did...that would be cool. yeah I agree. But venom is gonna be awesome! I hope Venom looks exactly like this. i don't want venom to be wearing the spidey threads. I highly doubt Venom will have the Spidey threads. I guess they think since Spideys black suit had them that Venom's suit would also have them.